I get an InvalidOperationException (‘System.Windows.Data.CollectionView’ view does not support sorting.) What am I doing wrong? Sorry. I really should have been more clear in my description of the sorted dictionary class. Just like the standard dictionary, this class does not support sorting via a CollectionView. Rather, it provides a dictionary that stores its items already sorted. You must supply an IComparer instance when constructing the class. Clearly, this adds some overhead to the dictionary. You would only use a sorted dictionary if you knew that you would be binding to it and you needed the bound items to appear in a certain order. This is no where near as convenient as the CollectionView approach where you are really only sorting a view of the items. Again, a dictionary does not lend itself nicely to such an approach, since it is really built for speed. you’re class is really interesting and helpful. I found only a small bug in it but I am not really sure how to solve it. The problem happens when I try to iterate in the ObservableDictionary collection. Unable to cast object of type ‘Enumerator[System.Collections.DictionaryEntry]’ to type ‘System.Collections.Generic.IEnumerator`1[System.Collections.Generic.KeyValuePair`2[System.String,System.Int32]]’. Thanks a lot for your help, this class if very useful. Unfortunately for me I discover yesterday that I cannot use it in my current project. The problem I discovered is that I cannot bind in TwoWay mode the Key and Value properties of ObservableDictionary items because they are, of course (but I didn’t know before yesterday 🙂 ) ReadOnly because part of structure KeyValuePair. In any case this is indeed a very nice class that I will use in other projects. Keep up the good work you are doing in sharing WPF code and hints. This is probably highlighting my lack of low down knowlage on the subject, but, when binding an Infragistics xamDataGrid control to your ObservableDictionary only the type of the value is displayed where as using a standard Dictionary object the value (in this case a List (Of T) object) is fully enumerated. Is this one of the limitations of making the Dictionary observable? 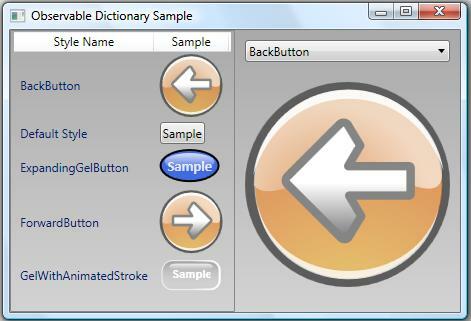 This class should behave in the same manner as a native dictionary when used as the source for a collection binding (unless the control is designed to behave differently when bound to a dictionary). If you can send me a simple repro that demonstrates the difference you’re seeing, I’d be willing to take a look. Thanks so much for sending the sample application! You were absolutely correct! The default enumerator for the native Dictionary class returns KeyValuePair objects, whereas my enumerator was returning DictionaryEntry objects. I have updated the code to include a custom enumerator so that it behaves just like the native class. Please give this a try and let me know if it works better for you. Thanks again for helping me make this code better! I don’t think you want a two-way binding. There’s no way to add entries to the dictionary automatically if entries are added to the ComboBox. I would need to see a full repro to really understand your scenario. First of all, thank you for your ObservableDictionary class. I really like it since it helps to keep my code clean! In my project, I bind a WPF TreeView control to the ObservableDictionary and it works perfectly, except for one operation : Remove. Message="Added item does not appear at given index ‘4’." Hey Martin. Sorry for the late reply. This sounds like a bug worth investigating. Can you send me a repro? I am having exactly the same problem as Martin. When removing an entry from the dictionary, I get the InvalidOperationException. Did you find a solution to this one already? Would be great! Martin was kind enough to send me a stack trace, but I would still love to get a repro that I could actively debug. If you have something handy (and not too complicated ;-)), I’d love to get it and track this issue down. It looks a little weird to me, but I will try to find the problem and post it here. If you or anyone has an idea, do not hesitate to post it here! At least the problem does not seem to be related to your ObservableDictionary. I think I figured it out… I had bound several CollectionViews to the same data source, and each view had another filter applied to it. Now, the exception was thrown when I removed an item from View1 which was not visible in View2 due to the filter. It seems like View2 tried to remove the item from the list although it was not even in there. Therefore the provided index was out of range because View2 displayed far less items than View1. The ObservableDictionary class is designed specifically for WPF (or other frameworks that listen to INotifyCollectionChanged and INotifyPropertyChanged). If you wish to use it with other platforms (like WinForms), then yes, you will need to add the additional required interfaces. I probably would not try to derive from BindingList<T>, since that will require a pretty large rearchitecture. Has anyone really solved this? I constantly am getting this if the dictionary is populated immediately on application start up. If it is populated later and modified nothing goes wrong and the UI and dictionary update as expected. Otherwise you get the error and the ListView or ListBox never updates again and the ObservableDictionary throws exceptions constantly in the background when an item in the dictionary has changed. This seems to happen on SetEntry when you have a new update and you remove the old value and populate the new. The exception seems to happen immediately after the NotificationCollectionChange event is fired. Sent you a fully working example that breaks the dictionary. BTW, if you are updating the Visual Element Via TCP WCF or some other transport.. then you will want to check the this.IsLoaded on your Window or Framework Element before you update the ObservableDictionary. I don’t know if this is a bug or something you should do for all ObservableCollections. Thanks so much for the repro, Nick! That was exactly what I needed. It turns out that I missed a couple of things in the change that I made for Paul back in April. This fully explains the problem that Martin reported (and probably others too). I have posted an updated sample that contains the simple 2-line fix. Please grab it and verify that it works for you. Wrt asynchronously accessing the collection, there are definitely some issues that you must address when accessing any observable collection. As long as the work is done on the same dispatcher that was used to create the collection, everything should be copacetic. You certainly shouldn’t see exceptions based on whether the elements have loaded. This would also be a good thing to test with the updated ObservableDictionary class. I am checking out your class and I noticed a potential bug that VS 2008 SP1 points out. In ObservableDictionary.cs, method GetIndexAndEntryForKey, line 220. “The out parameter ‘entry’ must be assigned to before control leaves the current method”. While the compiler marks it as an error, it appears to be treating it as a warning and letting the compile and link finish. Normally, I would suggest that the output parameter be set to null, but since it is a struct and not a class, I am not sure what would be the best value. That’s not a compilation error… it’s the code editor being over dilligent with its intellisense errors. The compiler realizes that the out parameter is a struct and therefore has no real need of construction, but the code editor does not. I’m working on a project and I was using ObservableColections and Dictionary until I found out this link, this ObservableDictionary makes life much easier, thank you. I cannot reproduce the problem you describe. I would need a simple repro to understand what is happening. I am trying to bind a DependencyProperty on a FrameworkElement, of type Person to an index within an ObservableCollection. So, if it is bound to element 1, whenever element 1 is replaced with a new Person object, the binding should fire and the DependencyProperty should be updated with the new Person. As I couldn’t use index’s within property paths in Silverlight, I switched the ObservableCollection to your ObservableDictionary, and simply keyed the entry on Person.PersonID. However, this is still not working. I see that in your example, you only bind to the whole collection not an index within the collection. Should this be possible using you ObservableDictionary? I’m afraid that scenario is not supported via WPF’s binding framework. You would need code logic to insert/replace the item at a specific index. I don’t have the before and after to diff against for your 2-line fix. What did you do to fix this? I’m having a similar bug in some code I’ve written. My fix was pretty specific to my class, as detailed below. I have a test program that I have bound three TextBoxes to three different dictionary keys. If I update the value in the text box, the dictionary get’s updated. If I programmaticly update the dictionary the text box does not get the updated value. My Mode is set to BindingMode.TwoWay. Is this something that should be doable with your dictionary? The two-way binding in your scenario will work if and only if the source object provides property change notifications. If your key values are objects that implement INotifyPropertyChanged, then it should work. Hi Yurik–Thanks for that bug fix. That is EXACTLY what was missing. Personally, I think it should go in "FirePropertyChangedNotifications" outside the if statmentment. I put it there since an item can change without the Count changing and since this method gets called from other places. If an item is added or removed wouldn’t the Item also be updated??? Should "OnPropertyChanged("Values");" be outside the if too? Thanks for the suggested improvements, Yurik and Jim. There are actually lots of optimizations that could be made to this class, but I’ve not had the bandwidth to properly test such changes, and I continue to procrastinate there. 🙁 I took a lot of shortcuts (like editing an item by simply removing the old and adding the new) when I first put the class together. I’d like to register to get the change events directly. The following code is what I am attempting, but the collectionChanged method is protected. What is the proper way to register interest? Thank for the great work! wow since 2007 (when you wrote it) has now more than 2 years passed by and I can even now after so many years use your great class. I am trying to use your Observabledictionary under silverlight 3. MS didn’t make any improvements in this field since ver.2. I’ve noticed that the ISerializable and IDeserializable are not supported in SL. So your serialization part doesn’t work in SL. My question is. If I replace not working Ser/DeSer code with IXmlSerializable and methods like write-/readXML would it be enough? Note that the serialization interfaces simply don’t exist in Silverlight’s CoreCLR. This means you can create an ObservableDictionary for Silverlight that is fully analogous to the native Dictionary class without supporting serialization. Thanks for the class! Saved me a lot of time. One thing, I’m using it in VS 2010 B2 and get 3 CS0693 warnings. These look like BS warnings to me, but apperently Microsoft decided you can’t use the same names for inner template params as you do for the outer ones. The warnings are because you named all the collection params as TKey and TValue.